Fans of technology, the week you look forward to at the beginning of each year has arrived. 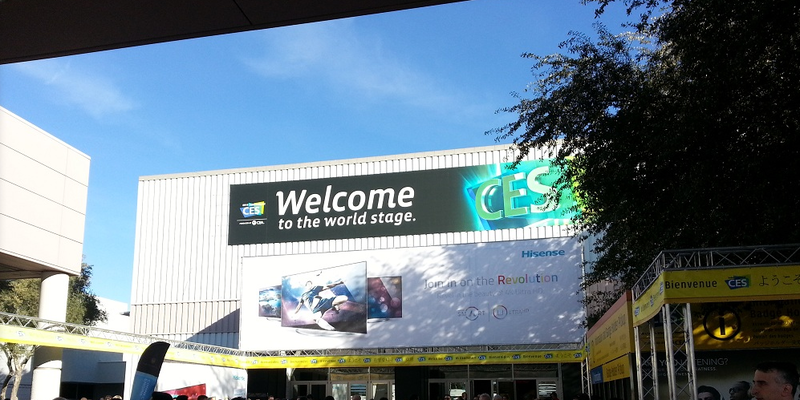 It’s time for CES (Consumer Electronics Show). Our bags are packed, all the gear we could ever need is loaded up (and pictured below), and we are about to take off on our journey to Las Vegas. Thankfully, we aren’t on the east coast where media members are already having to cancel meetings due to winter storms. Our sunny west coast couldn’t be happier, and will ensure we arrive on time to bring you all of the happenings as they…happen. For those not familiar with CES, think of it as the ultimate tech geek convention of the year. Over 100,000 attendees show up to Vegas each January to watch as mega-tech companies unveil new products for the upcoming year. In the past, we saw a lot of mobile-related items, though that has tapered off over the last couple of years since companies now like to hold their own stand-alone press events. Still, you’ll see everything from new trends in TVs to smarter cars to announcements on wireless products. It also tends to get weird at times too, with the slimiest of companies doing their best to hawk cheaply made accessories or services that no one in their right mind would ever use. We also see what the industry has pegged as the trends of the moment and try to decide whether or not they will shine brightly or flop impotently. For example, two and three years ago, CES was filled with Android tablet on top of Android tablet. Almost all of them failed, but that was the big takeaway. Before that it was 3D TVs. This year, it’ll likely be about wearables. You’ll see great smartwatches, terrible stuff (like head gear), and hopefully a few standout items that will help shape the category. As is typical around these parts as we embark, we try to bring you up to speed on our schedules, so that you can keep track of everything live. Many of the keynotes, press events, and other festivities will be streamed for the world to see. For the most part, we’ll be running live blogs as throughout, but will certainly do our best to embed live streams as they become available. CES doesn’t official begin until Tuesday – well, that’s at least when the show floor opens at the Las Vegas Convention Center (LVCC). Being press, our week kicks off tonight, with an event hosted by NVIDIA. Then on Monday, you are looking at the big day for us, as the Monday before the gates open is press day at CES. This is the time that companies like LG, Samsung, Intel, Qualcomm, and Sony all own a 45-minute block of time where executives take to elaborately built stages and put on multi-million dollar shows to unveil new products. Once that long, long, incredibly long day is over with, we take to booths and other meetings throughout the rest of the week in Vegas. It’s a glorious and not-so-glorious time. CES Unveiled (4PM): The first official event of CES is called “Unveiled.” It’s normally our chance to pick up press badges and then grab a snack or drink and view a few booths ahead of the show opening. We tend to skip this each year because it’s almost always filled with garbage, but LG told us that they will be in the building with something to show off. Stick with us around that time to see what it may be. If anything, we will at least spend some time with the G Flex. NVIDIA (8PM): Tonight, like last year on the Sunday before CES, NVIDIA is throwing a press event. We aren’t sure what they’ll have to show off, but would imagine it’ll include talk of their next mobile processor. Last year, they gave us SHIELD and the Tegra 4. Hopefully this year we get the Tegra 5 and an actual phone partner rather than just another timeline. The event will be live streamed, plus we’ll have a live blog and a look at whatever comes out of it. You won’t want to miss it. LG (8AM): I’ll (Kellen) be in attendance for this event. Still not sure if there will be a live stream, but the live blog will be flowing. LG shows off everything from TVs to appliances to mobile products. Expect all sorts of 4K TV announcements with a sprinkle of phone stuff. We may see a fitness band or an announcement about their new octa-core processor. Tough to tell. AT&T Developer Summit (9AM): Tim will be hanging with AT&T in the early morning to see what they have in store. All of their big wigs should be on stage at some point. They typically do not live stream this event, but announce plenty of goodies from phones to network news. Huawei (10AM): We’ll likely skip this one, especially with Huawei seemingly giving up on the U.S. market, but there should be phone announcements to be had. Pebble (11AM): Pebble is only live streaming their event, so we’ll be tuning in with you as their announcements unfold. We may setup a live blog, but more than likely will just put up an embed. Hoping to see new hardware! Asus (12PM): Asus is in Vegas and live streaming their event. We’ll have it embedded if possible, as we’ll be at Qualcomm’s press event at the same time. Hopefully we hear about the U.S. arrival of the Padfone or something to get our hands on when the show floor opens. Qualcomm (12PM): Snapdragon 805 news? Probably. Whatever happens, we’ll be there to cover it, though we have no word on a live stream. We have lots of time setup with Qualcomm as well throughout the week, so whatever does happen, we’ll have hands-on time with it. Intel (1PM): Intel will likely talk about both Windows and Android in some manner. Each year we keep expecting big Android news out of them, but each year we seem to be let down. Maybe this is the year? And whatever happened to that Motorola deal that was supposed to change the industry? No word on a stream. Samsung (2PM): Samsung may show off the Note 3 and Galaxy Gear (again), but I would be surprised if they announced any new mobile products outside of a tablet or two (Galaxy Note Pro?). They hold big time press events for phone releases these days. Their event will be a big show, it’ll just be about TVs, appliances, and then a sprinkling of Android. No word on a stream. Sony (5pM): We have no clue what to expect from Sony other than 4K TV stuff. Last year, with the Xperia Z, we knew everything about it before they announced it and also knew it was coming at CES. No rumors are circulating at this point with regards to mobile. No word on a live stream. PepCom (7PM): PepCom is an annual must-attend CES event for press. It’s a gathering of most of the big tech players who set up booths in an intimate setting to show off products before the CES show floor opens. We’ll be there after press day wraps to hang with all of the big names. The show floor opens! We have meetings setup with Motorola, Qualcomm, Samsung, Blackberry, and more throughout Tuesday and Wednesday. We’ll also stop by random booths here and there to try and find products that may not be in the news or on front pages of tech sites. This is our time to live in the CES moment. T-Mobile UnCarrier: On Wednesday, T-Mobile will unleash UnCarrier 4.0. It should be a wild time, and we’ll be there to bring it to you as they kill off more “pain points” in the wireless industry. Every now and then, when we travel to events, readers ask what we bring along to help feed the greatest Android community on the planet with news. So, here are a couple of gear pics! Mine is up top, Tim’s is below. In my bag, in terms of tech stuff, you are looking at 13-inch Macbook Pro, Sony RX100, Sony NEX5Twith 30mm macro, Nexus 10, two portable chargers, two Moto Xs, LG G2 (Verizon), and a set of Apple Earpods (sorry!). Non-tech stuff, I’m bringing banana chocolate chip Kashi bars for energy, Emergen-C Immune+ to fight off the CES zombie bird flu, aloe hand sanitizer (to stay clean and fresh), and gum for all those up-close meetings. 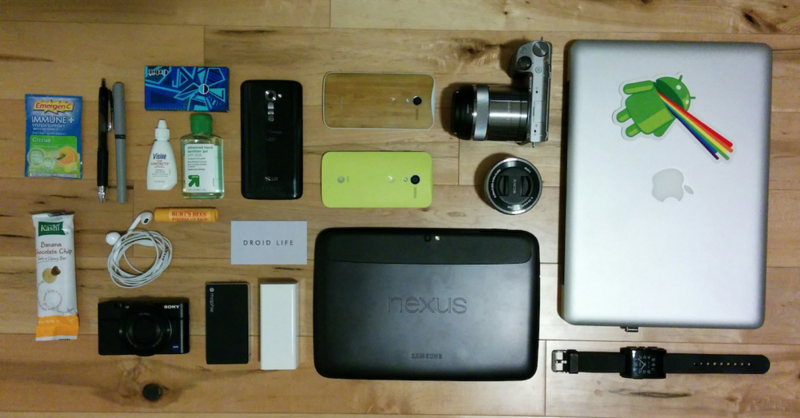 In Tim’s bag, you’ve got a 13-inch Macbook Pro, Galaxy Gear, Nexus 7 (white), Galaxy Note 3 (AT&T), Nexus 5, Galaxy S4 (AT&T), Galaxy Camera, G Pad 8.3 (Google Play Edition), and some House of Marley in-ear buds. He’s got snacks and clean products as well, along with generic pain killers (for you know…). To make sure you don’t miss a thing, be sure to follow us on Twitter and Google+. We will also be posting at on of video, so subscribe to our YouTube channel. And that’s that. We’ll see you guys tonight with NVIDIA! And who knows, maybe we’ll see our good friend Dennis Rodman again.